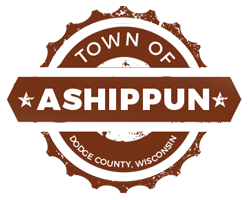 Welcome to the Town of Ashippun! The agendas, meeting minutes, notices and postings on this site are for convenience purposes only and may not represent the most current version. Therefore, they are not considered the official copy nor should they be considered a legal representation of the official copy. If you require a copy of the official version of one of these documents, please contact the clerk's office. State law requires licensing of all dogs more than five (5) months of age. Fees are due annually before April 1st. License fees are $10.00 for each neutered male or spayed female and $15.00 for each unaltered dog. A late fee of $5.00 will be charged when a license is not obtained by April 1st or within 30 days of acquiring ownership of a licensable dog. Notice - The matter regarding a Future Land Use Map Requested Change at the Old Ashippun School Property will be discussed and possibly be acted on at the July 2nd 7:30PM meeting of the Ashippun Planning Committee. The Meeting will be held at the Town Hall. You can still review the documentation regarding the proposed change at the town hall. You can also view it on this website with the links below. Feedback is still being accepted. Wondering about Web Traffic to this Website?